The Butterfly Skills senior table tennis bat features a 5 ply junior size blade and 1.5mm Panasia reversed rubber. The bat is perfect for those who want to develop their skills and has the ITTF (International Table Tennis Federation) approval. It has been selected for the ETTA Skills Programme as the ideal bat for starting table tennis and is endorsed by English TTA and English School TTA as the leading bat for the school and recreation market. for submitting product information about Butterfly Skills Senior Table Tennis Bat We aim to answer all questions within 2-3 days. 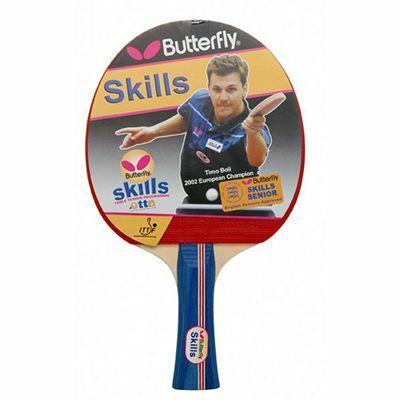 for submitting product information about Butterfly Skills Senior Table Tennis Bat. We aim to answer all questions within 2-3 days. If you provided your name and email address, we will email you as soon as the answer is published. for submitting product review about Butterfly Skills Senior Table Tennis Bat.